Local pet owners will soon have a new place to purchase all their dog and cat essentials, as the souths premier natural-pet store opens in Ferring. Shoreline Pet Supplies, the family run pet store which has been serving the community for 24 years, is opening a new store on Ferring Street in Ferring, and rebranding both to Browns Natural Pet Store. Specialising in natural foods and treats to toys and accessories for cats and dogs, the new store will cater to the growing interest in products designed for pet health and wellness. It will also include an Ethical Pet Spa offering chemical-free treatments and grooming services as well as speciliased scales to help owners monitor their dogs weight. “We are thrilled to be opening a new store in the area” said Rob Brown, owner of Browns Natural Pet Store. The recent shift in product awareness has created a much more discerning modern consumer – one who questions the origins and quality of the food they put into their body. This has continued, in recent years, as owners increasingly take a closer look at what they buy for their pets, driving demand in natural, healthier products. 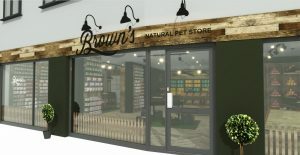 The new Browns Natural Pet Store will open its doors this July and can be found on 52-56 Ferring Street, Ferring – opposite the Village Green. The existing store on Goring Road will remain open for business as usual throughout the rebrand.